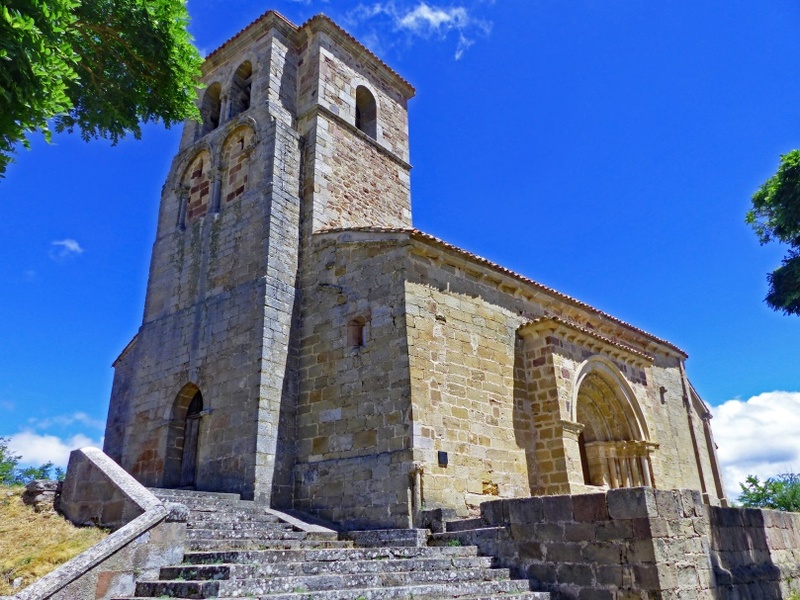 The churches in this itinerary are all located a short distance to the northeast of Aguilar de Campóo. They are locked but can be visited with guides appointed by the government who can also arrange visits to nearby archaeological sites, menhirs, and historical bridges. The guides can be contacted by telephone +34 636 838 570 or by email at guias.valdeolea@gmail.com. Their fees are minimal. 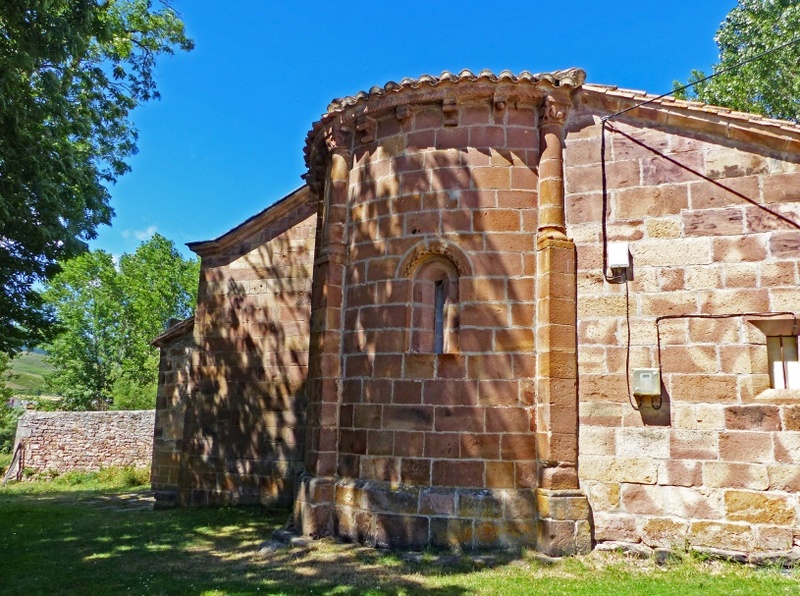 The churches of Valdeolea that have frescoes are located in the villages of Santa Olalla, Las Henestrosas de las Quintanillas, and Mata de Hoz. Allow an hour and a half for visiting them all. 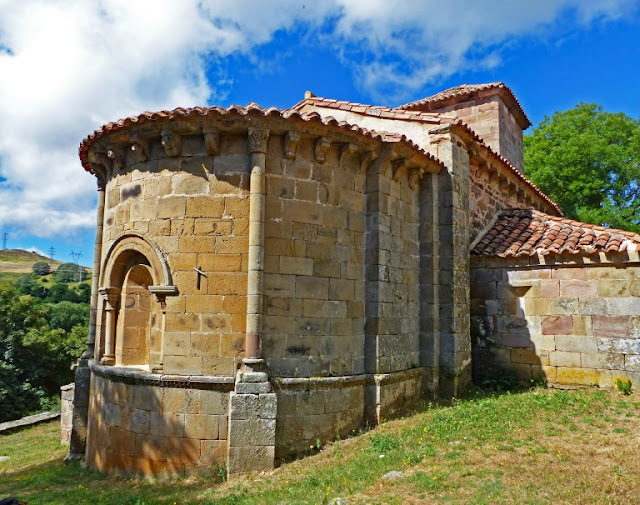 During the same trip you can also visit the rural Romanesque churches of Santa María de Hoyos and San Martín de Hoyos which will require an additional hour. Towards the end of the 15th century a painter arrived in this area. He joined the workshop of the Master of San Felices which was active during the second half of the 15th century in Aguilar de Campóo and the surrounding area. 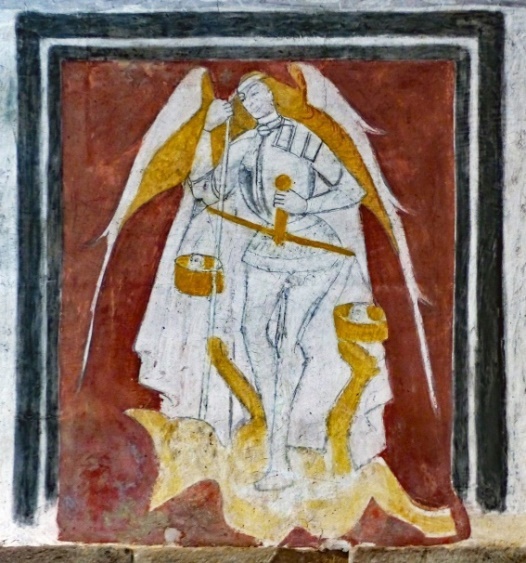 He decorated several churches in the province of Palencia and also three of the churches of the Valdeolea Valley – San Juan Bautista in Mata de Hoz, Santa María La Real in Las Henestrosas de las Quintanillas, and Santa Olalla in La Loma where his best and most lively paintings are to be found. He used a technique involving a mixture of fresco al seco with details touched up in oil. The colours he used are white, black, and yellow and red ochres. The village of Las Henestrosas de las Quintanillas is 10 kilometres north-northeast of Aguilar de Campóo ‘as the crow flies’. Take the P-220 from Aguilar for 5.7 kilometres to Nestar and then the PP-2208 (which becomes the CA-834) for a further 6 kilometres. 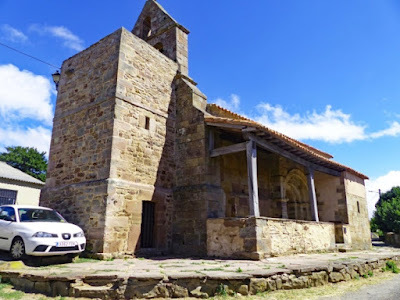 Then take the Carretera de Bercedo for 1.4 kilometres through Las Henestrosas and on to the church of Santa María La Real which stands isolated on a small hillock above the river Quintanillas, a tributary of the Camesa River. Its GPS coordinates are 42°11’20.17” North, 4°11’42.42” West and it is at an altitude of 930 metres. 1. The west and south façades of Santa María La Real. The road takes you to below the hill where there is enough parking for two cars and from where a long staircase leads up to the compound. Despite the present isolation of the church, there was a Roman settlement here and, possibly at a later date, there was a village around it. Nearby is the archaeological site of Torrejón de Las Henestrosas and also a 17th century house called the ‘Palacio de la Corralada’. There is a stunning view of the church as you approach it from the road. A wall surrounds the church on the east and south and, on the north side, there is a meadow which originally served as a cemetery. Access to the church is through the west doorway which was created in the lower wall of the belfry in 1680. The lower part of the present belfry is the original Romanesque bell tower to which an upper storey, with six arched windows surrounding the bell chamber, was added ca. 1503. At that time a south aisle was added to the nave which resulted in the destruction of the original Romanesque wall. The south entrance projects from the wall and has a roof over it. The slightly pointed entrance arch is surrounded by four archivolts resting on an extended impost. The capitals are decorated with crocket (stylised with the endings being rolled-over volutes) and monolithic columns. The first archivolt has roll moulding, the second chevron moulding, the third roll moulding between two concave ones, and the fourth plain voussoirs. They are surmounted by a plain concave dripstone. The original south cornice, decorated with rhomboids, was carelessly placed over the new south wall and only one original Romanesque corbel has survived which has an acanthus with bent-over leaves. The presbytery walls and the apse are lower than the nave and have remained intact. The cornice of the south presbytery has two rows of hollowed rhomboids. It rest on five concave figurative corbels. 1: Concave with a roll at either end. 2: A large acanthus leaf. 3: An acrobat, frontally depicted, with legs bent backwards and holding his feet. 4: A man with his legs crossed, playing a string instrument which rests on his left shoulder. 5: A female dancer bent over backwards, her long hair streaming out behind her. The last three corbels could represent popular entertainers which, in the Middle Ages, went from village to village. The apse is divided horizontally into two sections by an impost and vertically into three bays by two twin engaged columns which end in capitals below the cornice and rest on buttresses that reach to the height of the impost. The roof rests on a cornice decorated with hollowed rhomboids supported by a corbel table. The central bay has a window. The first four corbels are by the same master who carved the ones in the presbytery. 1: Concave with a roll at each end. 2: An acanthus leaf, the ends of which turn over in the upper part. This theme is often seen in Piasca and Aguilar de Campóo. 3: A seated monk wearing his habit which has a conical hood and wide sleeves. He holds an open book on his knees. 4: Another seated monk, much damaged. He holds a tablet on his knees on which he is either writing or drawing. First double capital: It has stylised acanthus leaves with their tips turned over. It lacks abaci. 5: A deer seen from behind but with its head turned around. 6: A seated man blowing a hunting horn (corbels 5 and 6 could be related to deer hunting). 7: A lion with a long spread-out mane as seen from behind. 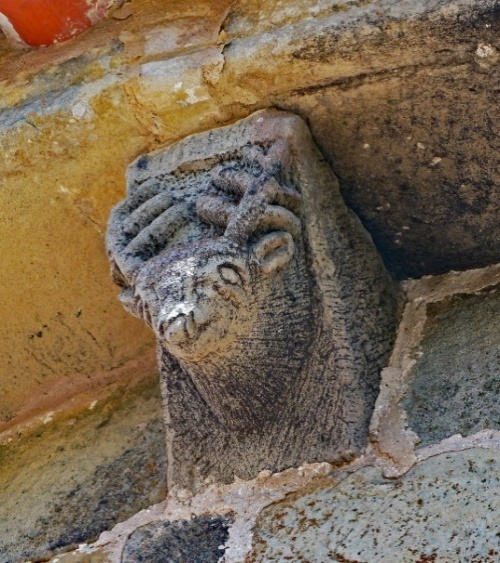 This lion and the deer are also depicted in the apse of Piasca and are likely to have been carved by the same master. 8: A long-beaked bird, a crane or a stork, with a snake curled around its beak. There is a similar one in Piasca. Second double capital: It is much eroded and seems to have had the same acanthus as the first one. 9: Concave with a roll at each end. 10: A large acanthus leaf. 11: Concave with a roll at each end. 12: Damaged because of the later construction of the sacristy wall. The splayed loophole window has been blocked. It is surrounded by a scalloped archivolt surmounted by a dripstone carved with fillet, roll, and concave moulding. It rests on beautifully carved abaci. The left column is monolithic. The right column is spirally fluted and decorated with four-petal flowers in between the flutes, reminiscent of the cloisters of San Andrés del Arroyo and of the left column of the doorway of Santiago in Carrión de los Condes. The left abacus is carved with two pairs of fleshy palm leaves emerging from a central calyx. The first pair of leaves curl upwards and the second pair curl downwards. These kinds of long and curly leaves were used by the master carvers of Rebolledo de la Torre and Piasca. 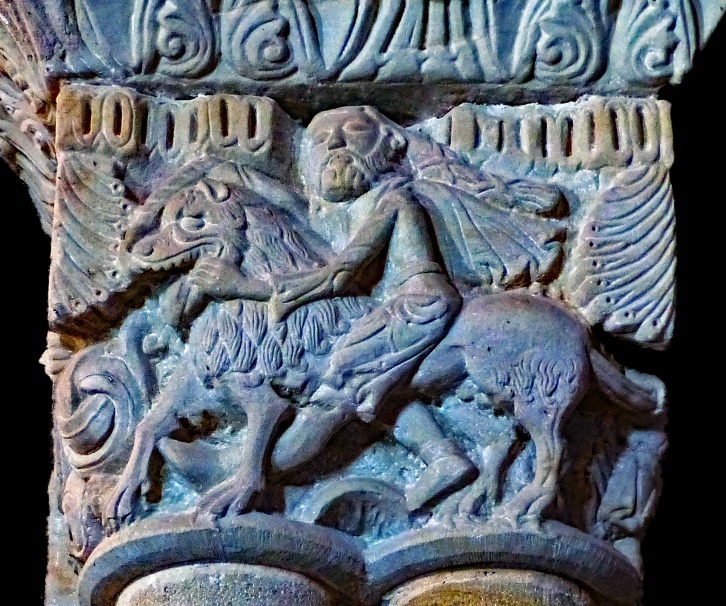 The left capital is carved with two rampant confronted griffons enclosed by ribbed and beaded ribbons. This capital is almost identical in theme and manner of carving to one on the right side of the west door in Piasca and Rebolledo de la Torre. The art historian, García Guínea, has assigned it to the same sculptor, Covateiro or Juan de Piasca, who are probably one and the same person. The right abacus has deeply divided fleshy leaves which turn over at their tips, creating a strong sense of chiaroscuro. The right capital has a winged basilisk on its right side. A beaded ribbon falls out of its mouth and divides into three strands, each forming a whirlwind. Of the original church, the only Romanesque remains are the apse, the presbytery and the triumphal arch which is decorated with triangles or zigzags. Its capitals are by the same mason who sculpted the exterior. 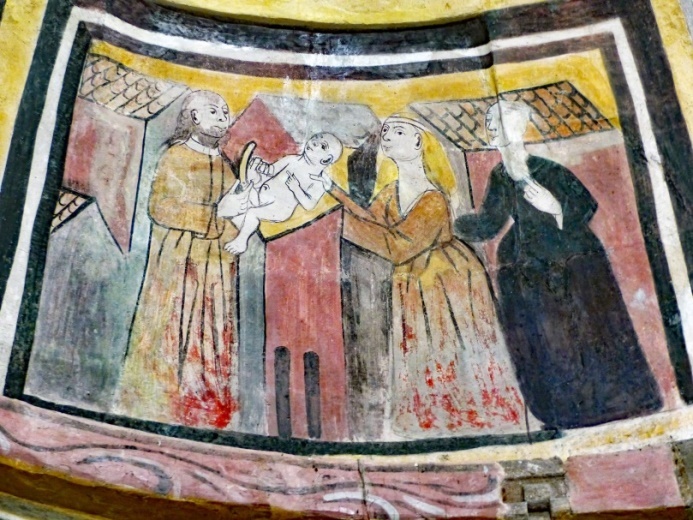 The ceilings and walls were covered with frescoes at the end of the 15th century by the Master of San Felices de Castillería with scenes very similar to those he did in the nearby church of Santa Olalla in La Loma (Valdeolea). The enlargement of the church took place a few years after it had been finished. The workshop was from Aguilar de Campóo. The arches and large capitals are decorated with crocket leaves and the imposts with three-quarter arches (andresinos) which are similar but more restrained than the ones in San Andrés de Arroyo. They could only have been sculpted by a very proficient workshop. The north capital has Samson prizing open the jaws of the lion of Timnah. Samson is on the front of the capital, his long hair gathered by ribbons and his cape billowing out behind him. He is riding the lion and prizing open its jaws with both hands. His left leg is extended between the forelegs of the lion and with his right leg he is pushing backwards demonstrating the effort he is making to prize open the lion’s mouth. The lion has a thick mane and its paws rest on the rim of the capital. Samson subjugating the lion of Timnah is a reminder to the faithful of the need to overcome their primitive passions. A seated figure on the right side of the capital holds the lion’s tail. On the left side there is a winged basilisk fighting a serpent. It is biting its beaded body and its forked tail is wrapped around whirlwinds. The upper part of the capital is decorated with what could be crenellations indicating the Heavenly Jerusalem. Emerging from each corner is a diamond-shaped leaf that extends halfway down the capital. A very similar capital, including these unusual leaves, can be seen in San Julian y Santa Basilisa, Rebolledo de la Torre (Burgos). Santa Eufemia de Cozuelos (Palencia) has a similar scene but without the crenellations. The abacus has different kinds of flattened acanthus leaves. 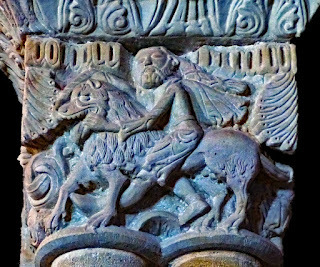 The south capital has two pairs of confronted griffons looking backwards. They become addorsed in the centre with their beaks nearly touching. They are very similar to the ones in Santa Cecilia, Vallespinoso de Aguilar (Palencia). Both capitals seem to have been sculpted by the Master of Santa Eufemia de Cozuelos, especially the Samson capital. The frescoes were executed by a painter from the workshop of the ‘Master of San Felices’. 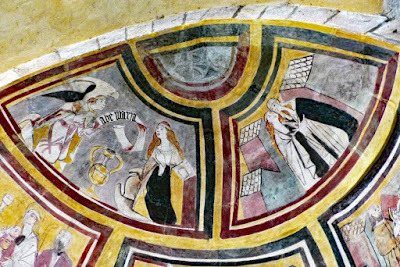 There are two scenes in the north presbytery. 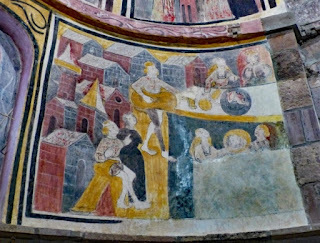 Though the upper scene is damaged, we can still see some of the haloed apostles sitting at a table laden with fish and bread. A woman sits on the left with a basket full of bread. Below the table, in the middle of the foreground, is the kneeling Mary of Bethany, her hands held high above a large jar. Most probably this scene illustrates the story of Jesus with his apostles in Bethany. 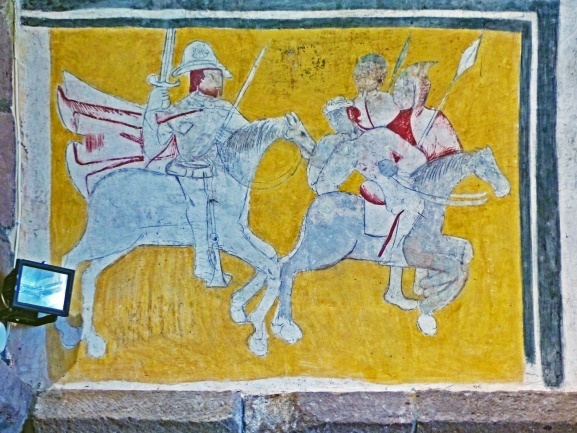 The lower scene depicts St James on horseback pursuing the infidels. This is a reference to the much loved Spanish legend of the Battle of Clavijo in 844 AD when the Spanish king, Ramiro I of Asturias, fought against the Emir of Cordoba. The Christians were outnumbered and were about to lose the battle when, miraculously, St James appeared and led the Christian army to victory. He became the patron saint of Spain, an honour he shares with St Theresa of Avila. When he is depicted in this way, he is known in Spain as Santiago Matamoros (the Moor-killer). Sadly, the altarpiece obscures a major part of the apse paintings. 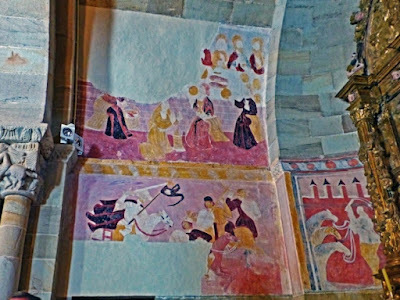 However, to the left of the altarpiece, on the north wall, a groom can be seen holding the reins of three horses which is most likely part of a scene depicting the Adoration of the Magi. To the right of the altarpiece, on the south wall, is the Massacre of the Innocents. 4. The Massacre of the Innocents. To the right is the Flight into Egypt. Mary is seated on a donkey with Jesus on her lap. Joseph is in front, holding the reins. Enciclopedia del Romanico en Cantabria, Fundación Santa María la Real, Miguel Ángel García Guinea (coordinator), Volumen III, 2013, pp. 1275-1287. The picturesque village of Mata de Hoz on the southern side of the Reinosa mountains is 16 kilometres due north of Aguilar de Campóo ‘as the crow flies’. Take the P-220 from Aguilar and after 10.2 kilometres, having passed Cillamajor, turn right on to the PP-2251. After 3.4 kilometres, having driven through Vallejo de Orbo, turn right on to the PP-2202 and follow this road for 8.8 kilometres to Mata de Hoz. The church of San Juan Bautista (St John the Baptist) is situated in the middle of the village. Its GPS coordinates are 42°56'1.24" North, 4°13'9.09" West and it is at an altitude of 990 metres. 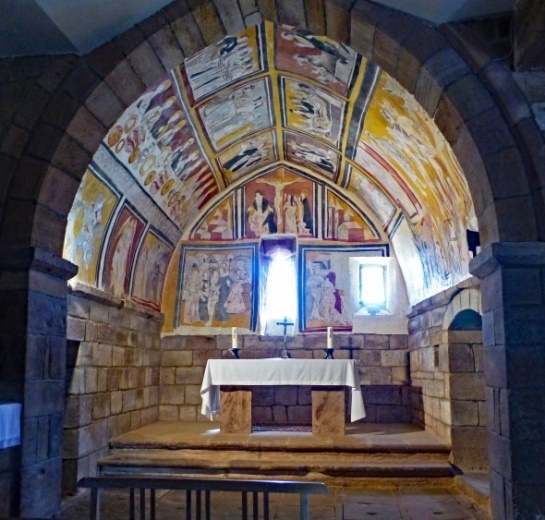 The original Romanesque church had a single nave with an apse which was later modified when a Gothic chapel was added to the north presbytery. Later, another chapel and a porch were added to the south side. The apse was originally divided into three bays by two engaged columns, only two of which are now visible, the Gothic chapel addition having obscured the north bay. The central section of the apse has a splayed loophole window surrounded by a billet dripstone. The roof rests on a rope-decorated cornice supported by a corbel table. 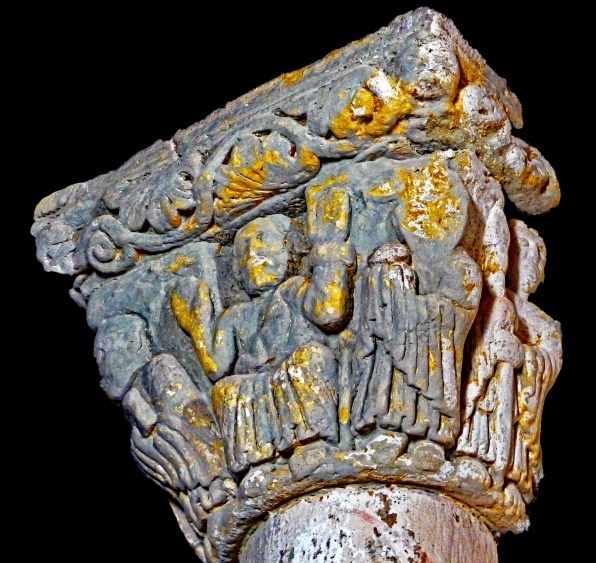 The capitals of the two engaged columns form part of the corbel table. 1. The apse and the Gothic north chapel addition. 1. A roll on each side of a cavetto. 2. An animal’s head, its mouth open and baring its teeth. 3: A cavetto with a pyramid at its centre and a roll on the top. 4. A roll on each side of a cavetto. 5. A cavetto with a ball at its centre. 6. Capital of the south column – three lions. The two on the right are confronted with their heads joined, forming a volute. 7. A roll on each side of a cavetto. 9. A roll on each side of a cavetto. 10. A cavetto with a ball at its centre. 11: Capital of the north column – two eagles, with splayed wings, at each corner. The projecting entrance is situated on the south and it is now sheltered by a porch. A small part of the right hand side of the archivolts was removed when the south chapel was built. The doorway has a slightly pointed arch surrounded by four archivolts and a dripstone resting on an impost decorated with rhomboids. The first two inner archivolts have roll mouldings. The third has dentils set in a concave arch and the fourth has billet decoration. The dripstone is decorated with tangential rhomboids. The arch rests alternately on capitals and jambs. The inner left capital is carved with stylised leaves while the outer has diagonal diaper-work. The single right capital has diagonally placed caulicles springing from its centre, each ending in a corner volute. The single nave has two chapels opening on the south and north sides just before the double triumphal arch which is followed by a straight presbytery and the apse. A billet decorated impost is followed by a painted cornice, both situated at the springing of the vault. There is another concave impost below the loophole window. The triumphal arch rests on billet imposts, capitals and columns, all set on high plinths. The left capital has two standing men with their raised hands touching. The one on the left touches the neck of a rampant lion of the left side of the capital. A small man holding a club stands on the lion’s back. On the right side there is a centaur holding a bow and arrow with a snake about to bite the centaur’s face. On the front of the right capital there is a pair of addorsed rampant griffons, each confronting a rampant lion on the sides of the capital. Their heads form the volutes. 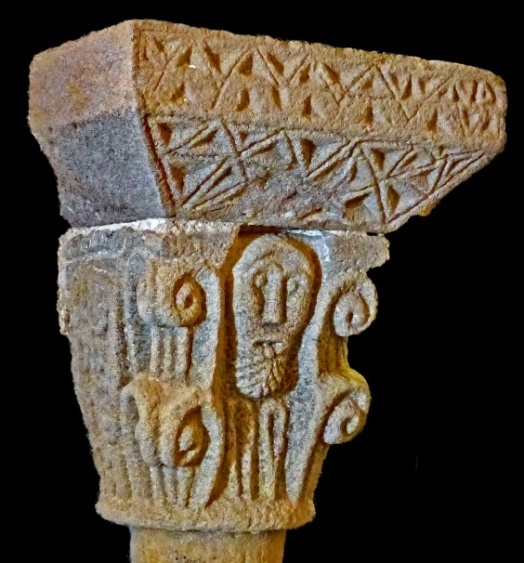 The round Romanesque font is undecorated and rests on a large round plinth. Upper register: The Annunciation and the Visitation. 3. The Annunciation and the Visitation. 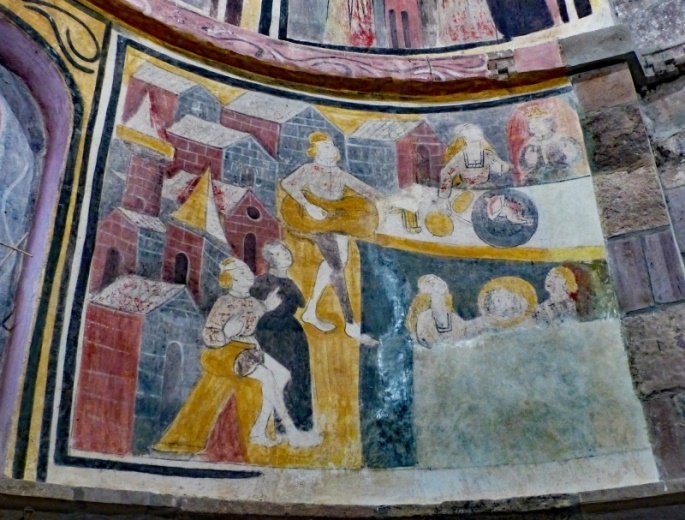 Middle register: The Adoration of the Magi, the Nativity and the Circumcision. 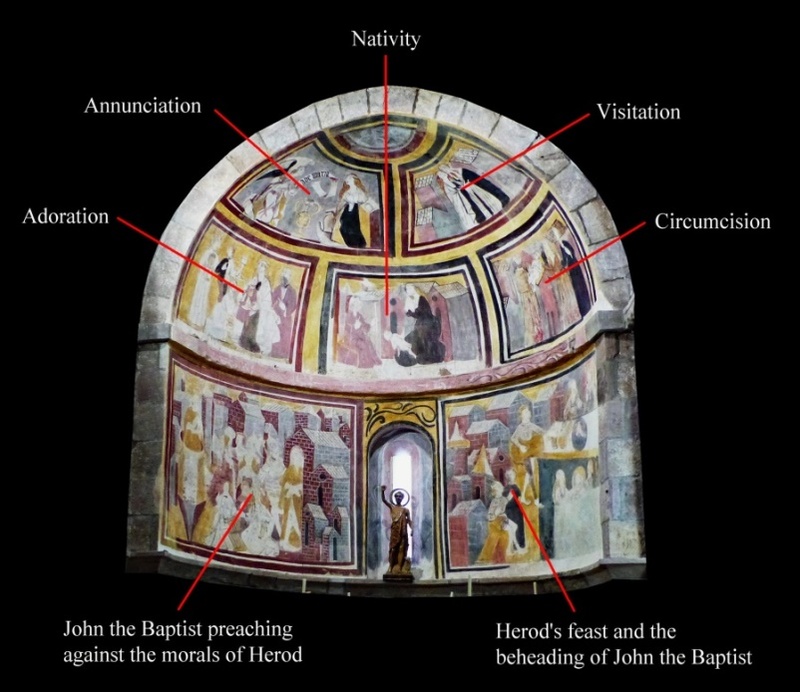 Lower register: To the left of the window is John preaching against the morals of Herod and Herodias and, to the right, the beheading of John the Baptist. Both scenes take place in a city landscape. The gabled houses are placed diagonally creating a feeling of space in an inverse perspective: that is, increasing in size towards the background. The following biblical quotation tells the story that is illustrated in the two paintings. In the left scene of John the Baptist preaching against the morals of Herod and Herodias, a few figures have been cleverly placed in three superimposed rows to achieve the impression of a multitude. John stands in a pulpit on the left, addressing the crowd. He is dressed in a courtly manner wearing a coat with long open sleeves rather than in his usual camel hair garment. In the front, Herod can be recognised because he is the only one sitting in an elaborate chair befitting his high status. A young woman, probably Salome, kneels behind him gesturing with her hands. Behind her stand a young man and a well-dressed woman, most likely her mother Herodias urging her to demand John’s head. In the background there are three figures listening attentively to John’s preaching. The first one is a bearded man wearing a pointed cap that covers his ears. He holds an open book in his right hand and points to it with his left. He is a conventional type used to represent a Jew in contemporary paintings. To the right is John with his hands tied in front of him, being led to jail. 5. The beheading of John the Baptist. In the right scene of the beheading of John the Baptist, Herod and Herodias are shown at top right, seated at the banquet table. On the table there is a plate with the miniature body of the headless John on it. In front of the table, a standing minstrel plays the guitar. At bottom left are two members of the court attending Herod’s birthday celebrations. At bottom right, Herodias’ daughter and a servant hold up a platter with the saint’s head on it. Enciclopedia del Romanico en Cantabria, Fundación Santa María la Real, Miguel Ángel García Guinea (coordinator), Volumen III, 2013, pp. 1295-1301. The tiny hamlet of Santa Olalla is 17 kilometres north of Aguilar de Campóo ‘as the crow flies’. Take the N-611 from Aguilar for 12.7 kilometres to Mataporquera and then the CA-284 north for 10.3 kilometres and then turn left on to the CA-833. Follow the CA-833 for 1.4 kilometres to Santa Olalla. The church is on a track 100 metres north of the hamlet. Its GPS coordinates are 42°56'4.73" North, 4°12'9.08" West and it is at an altitude of 975 metres. As far as the architecture of the church of Santa Olalla is concerned, not much can be said except that it belongs to the end of the 13th century when the Romanesque style continued to be used only in small villages. The barrel vaulted apse with an undecorated triumphal arch is the only remaining Romanesque part of the church. There is a square font resting on a round base that could also be late Romanesque. The church is remarkable for its lively frescoes. 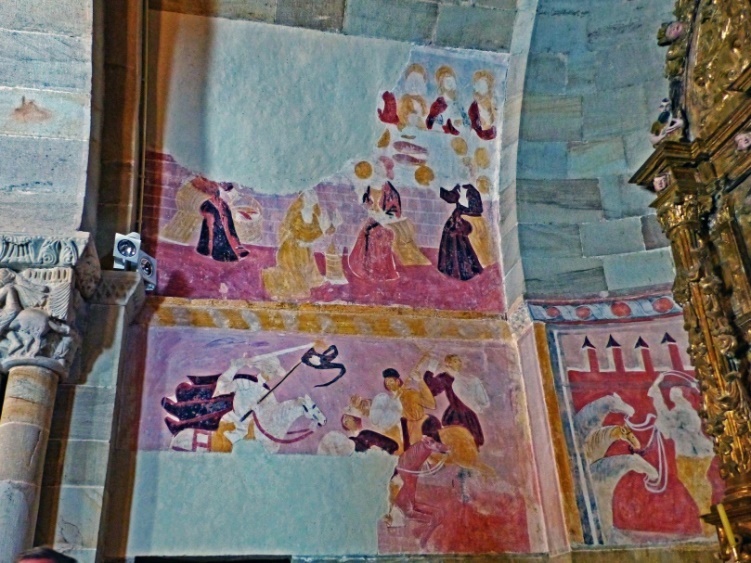 The painter from the ‘Master of Felices’ workshop covered the entire apse, the north and south vaulting, and the east wall with biblical scenes. The scenes are placed in registers within rectangles, each framed in different colours. The saint wears a hat decorated with a scallop shell, one of the most iconic symbols of pilgrimage to his shrine in Santiago of Compostela. He is on horseback, pursuing the infidels. This is a reference to the much loved legend in Spain of the Battle of Clavijo in 844 AD when the Spanish king, Ramiro I of Asturias, fought against the Emir of Cordoba. 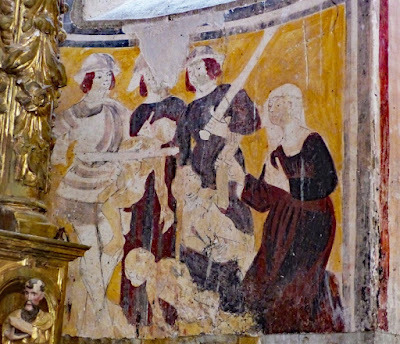 The Christian were outnumbered and about to lose the battle when miraculously St James appeared and led the Christian army to victory. When he is shown in this way, he is known in Spain as Santiago Matamoros (the Moor-killer). He became the patron saint of Spain, an honour he shares with St Theresa of Avila. 2. St James pursuing the infidels. Michael is depicted as an elegant courtier wearing a suit of armour with wings sprouting from his shoulders. In his left hand, he holds a balance with a soul in each cup and, with his right hand, he is spearing the devil on whom he is standing. The devil is pushing his foot against one of the cups, trying to tilt it so he can claim the soul. The scene is a reference to the weighing of the souls in the Final Judgement. 3. Archangel Michael weighing the souls. Santa Eulalia is depicted here because the church is dedicated to her (Olalla is another name for Eulalia). Eulalia was a twelve year old virgin who lived in Mérida when, under Emperor Diocletian (284-305), she suffered martyrdom for refusing to recant her Christianity. She was tortured and burnt to death in 304 AD. Her story continues on the east wall. Between the lower and middle registers there is a large grey band of tangential decorative rhomboids. Depicted against an ochre-red background Jesus sits at the centre of the table which is covered with a white tablecloth laden with dishes and different kinds of bread and fish. Jesus holds a cup of wine and blesses it with his right hand. John, the beloved apostle, is shown to the left of Jesus with his head resting on the table. To the right of Jesus is Peter, holding a large key. Judas sits at the extreme left, the only one of the twelve apostles without a halo. He holds a large basket of food (symbolic of the bowl in the quotation below) and points to himself as if questioning what Jesus has just said. Jesus is on the left with Judas at the centre of the panel talking to the soldiers who have come to apprehend Jesus. Jesus is in the centre of the panel tied to a pole. To the left Pilate sits in an ornate chair holding the baton, symbol of power. A soldier holds a knife and seems to be about to cut Christ’s hair to humiliate him. To the right, two people appear to be talking to Pilate. Jesus carries the cross and turns his head towards a soldier standing behind him who has just kicked him. A few soldiers and citizens walk ahead of them. On either side of the central panel of the Crucifixion are two panels depicting tall buildings, probably representing Jerusalem. In the central panel the Virgin Mary stands to the left of the cross. Unusually, she is alone and is facing the viewer rather than Christ. Longinus stands on the right carrying the spear with which he pierced Christ’s side. John stands behind him. The saint, with her torso naked, stands in front of the local governor who sits on the right. The saint sits headless with her hands tied in front of her. A soldier stands behind her holding the sword with which he has just decapitated her. In front of the cross, Mary holds the inert body of Christ in her lap. John stands on the left and Mary Salome on the right. Joseph of Arimathea and Nicodemus hold the white sheet in which Christ is laying into the tomb. Mary, the apostle John and two women stand behind the tomb. Christ is shown rising from his tomb holding the banner of the Resurrection. 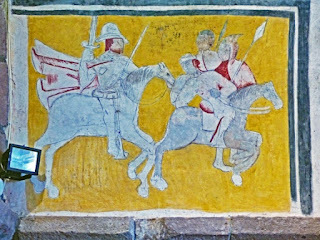 Of the soldiers guarding the tomb the one on the right is asleep, one on the left falls backwards in fright at seeing Christ rising. Another soldier points upwards. After descending to Hades and breaking its hold over the faithful dead, Christ returned bodily to the living world on the Sunday following the Friday on which he was crucified. This is the central tenet of Christian faith and theology. In the Nicene Creed, adopted at the Council of Nicaea in 325 AD, it says: “On the third day he rose again in accordance with the Scriptures.” The same statement is made by Paul in 1 Corinthians 15:3-4. The sentence is the Latin version of words spoken, according to John 20:17, by Jesus to Mary Magdalene when she recognized him after his resurrection. This is a large painting occupying the entire right side of the vault. Christ appears twice – first in separate panel on the left where he is shown walking into Hell carrying the banner of the Resurrection and second, in the main panel where he is pulling Adam, who holds Eve’s hand, out from the torments of Hell. 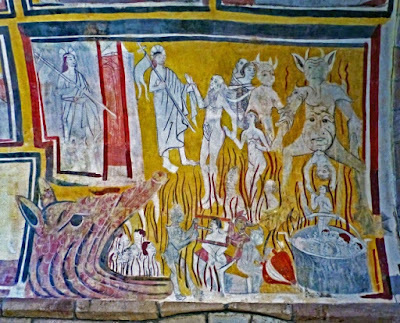 The sufferings of Hell have been vividly portrayed leaving no doubt as to the tortures that await those condemned to Hell: there are leaping flames all over the surface. Leviathan is on the left with his jaws open, gulping people into his mouth. To the right of Leviathan, two devils are sawing a man in half. Above him two men await a similar fate; one of them wears a bishop’s mitre. 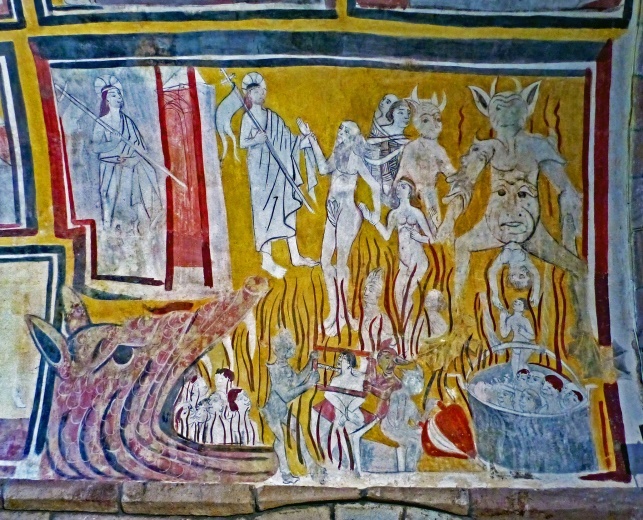 On the right, a large incredible devil with two faces – one on his stomach and the other on his head – seems to be discharging souls directly into a boiling cauldron. Their souls are being brought to him by another devil carrying them in a basket on his back. 5. The Harrowing of Hell. In Christian understanding it was only with the death and resurrection of Jesus that it became possible to go to Heaven following the sins of Adam and Eve, (Elijah and Enoch, both assumed bodily into Heaven, could be called the exceptions that prove the rule). The period between the Crucifixion and the Resurrection was understood as a period in which Jesus descended into this dark place, Sheol or Hades, and broke its hold over the dead, in particular rescuing the faithful dead of the Old Testament, starting with Adam and Eve themselves. James, M R, The Apocryphal New Testament, Clarendon Press, Oxford, 1924. Enciclopedia del Romanico en Cantabria, Fundación Santa María la Real, Miguel Ángel García Guinea (coordinator), Volumen III, 2013, pp. 1527-1528. The village of Hoyos is 19 kilometres north-northeast of Aguilar de Campóo ‘as the crow flies’. Take the N-611 from Aguilar for 12.7 kilometres to Mataporquera and then the CA-284 north for 13.5 kilometres to a junction with the CA-831. Take the CA-831 for 1 kilometre into Hoyos. The church of Santa María is on the northeast edge of the village. Its GPS coordinates are 42°56'28.25" North, 4°8'54.65" West and it is an altitude of 1,042 metres. The first written mention of Hoyos and other villages in the area of Valdeolea appear in a document dated 1275 in which the brothers Sandoval donated the houses they had in these villages to the monastery of Santa María in Aguilar de Campóo. They did this so that the monastery would build a church in Hoyos where they could have a family vault. The Romanesque church has a single nave to which were added a belfry, porch, and baptistery chapel. In 1632 a sacristy with its own entrance was built against the south wall reaching up to the roof thus covering the south cornice. 1. The east and north façades of the church. The original south entrance of the church has a double arch made of undecorated voussoirs both of which rest on imposts and jambs. A straight presbytery is separated from the apse by a buttress on each side. The apse is divided vertically into three bays by segmented columns resting on buttresses and horizontally into two sections by a stringcourse on which rests the central window. The cornice and stringcourse are decorated with tangential rhomboids. The splayed loophole window is surrounded by an archivolt and a dripstone, both with roll and scotia moulding. The left capital has acanthus leaves and the right has acanthus leaves ending in crocket decoration. 1: Either a crane or a stork with a snake wrapped around its beak. 2: Seated monk or man holding a pick or scroll on his lap. 3: Hare with large ears, seen from behind with its head turned around. 5: Seated man holding a book on his lap. 6: Seated stone mason holding a large pick on his lap. 7: South capital – much damaged pair of confronted harpies. 8: Palm leaf ending in a hooded ball. 9: Interlaced stems ending in a double fruit. 10: Four fruits or balls. 11: Animal seen from behind with its head turned backwards and with its mouth open. 12: Four leaves turned towards the centre of the corbel. 14: North capital – swirling stems, deeply undercut. 15: Cavetto with a roll at each end. 16: Cavetto with a roll at each end and with two triangles touching. The nave north wall has nine corbels, all of which are concave or a ship’s prow. The single nave has a pointed double chancel arch. The outer arch is decorated with chevron and the inner with guilloche set against a red painted background. The outer rests on an impost and jambs and the inner on capitals with abaci. 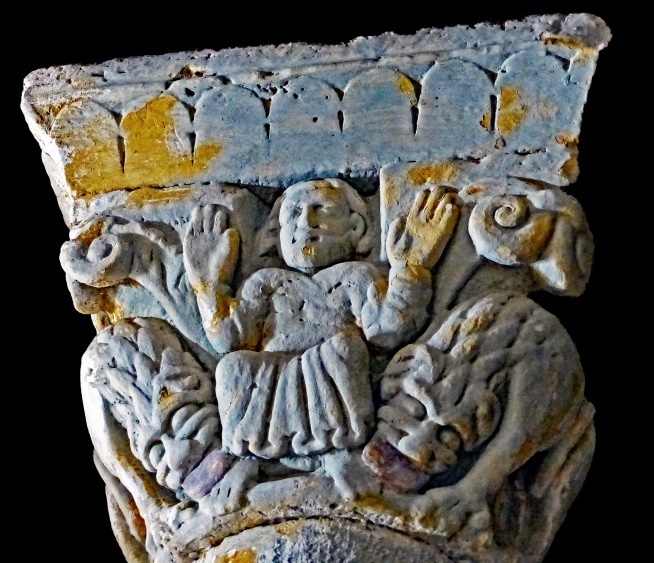 The left capital has Christ in Majesty in the centre with his hands raised. On the left, two apostles carry the cross. On the right are what appear to be Mary Magdalene holding an alabaster jar of unguent and, behind her, Mary Salome holding a censer. The pleats of the garments are similar to the ones in the cloister of Santillana del Mar (Cantabria). The abacus has undulating stems coming from the mouth of an animal head in the left corner. 2. 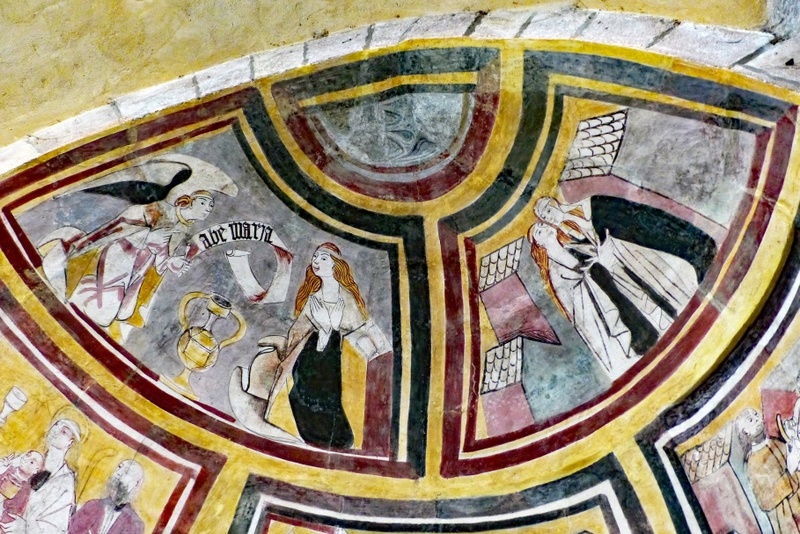 Christ in Majesty (centre) with Mary Magdalene and Mary Salome (right). 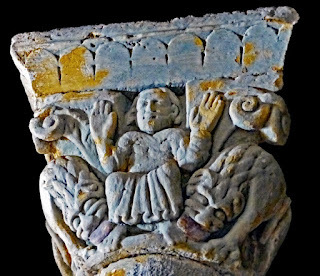 The right capital has a seated Daniel with his hands held high in the manner of Christ on the opposite capital. He has a lion on either side of him, licking his feet. The abacus has a flat three-quarter height arcade, a decoration typical of the monastery of San Andres de Arroyo (Palencia). 3. Daniel with lions licking his feet. The bases, carefully carved with astragal, scotia and torus, rest on square plinths decorated with chevrons which in turn rest on wider plinths. The right base has two fleurs-de-lis resting on the plinth. Enciclopedia del Romanico en Cantabria, Fundación Santa María la Real, Miguel Ángel García Guinea, (coordinator), Volumen III, 2013, pp.1288-1295. The church is situated within the hamlet of San Martín de Hoyos hamlet with a small mediaeval castle next to it. Its GPS position is 42°55'53.91"N, 4°9'14.52"W and it is at an altitude of 1,070 metres. To reach the church, take the CA-284 south out of Matamorosa towards Villaescusa. After 6 km turn left on to the CA-832. The church will be reached after a further 1.4 km. 1. West and south façades. The original church had a single nave and an apse but, soon after it was finished, two chapels were added on the north and south sides. The south door is surrounded by three archivolts resting on imposts and jambs and a dripstone decorated with billet and three fillets. The inner archivolt has a double roll moulding, the central has a rope and flat mouldings and the outer has roll and flat moulding. The apse is separated from the presbytery by a buttress on either side. It is divided horizontally in two by a very high billet impost. Originally it had one window which has been blocked. 1: The head and horns of a deer. 2. The head and horns of a deer (Corbel #1). 2: A bull’s head with its horns cut off. 3: A fierce looking animal facing downwards. Its feet have claws. 6: A bearded man facing forward and holding a barrel high over his head. He wears a belt. 8: Much damaged heads of animals. 9: The prow of a ship. The single nave has a double triumphal arch, resting on abaci, capitals and segmented columns. It is followed by a short straight presbytery and the apse. There is a billet cornice at the springing of the vault. There are two chapels on either side of the nave. The abacus has three strands of interlacing. The sandstone capitals are carved with an eagle with spread wings at each corner. There is a small lion over their wings at the centre of the capital. This sandstone capital is much weathered and so it is difficult to distinguish all the animal figures. The abacus has interlacing forming figures of eight. There is an undecorated double entrance arch to this chapel resting on capitals. The left capital has two rows of crossed-over caulicles ending in corner volutes. The right capital has two addorsed animals with their heads turned over to lick their raised tails. The chapel has a narrow altar with a statue of the Virgin. The double-arch entrance to the south chapel has an exterior archivolt decorated with rosettes inscribed within circles. The left capital has two riders with their horses’ heads coming together at the centre of the capital. The right capital has a bearded face in the centre surrounded by rows of volutes. Both abaci are decorated with a variety of triangles. 3. Right capital of the south chapel. 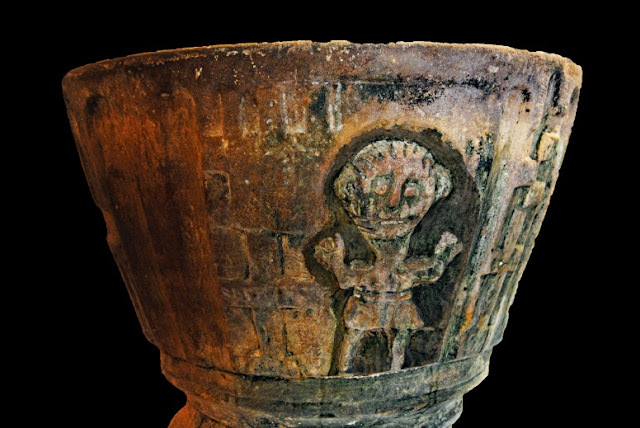 The font is conical and 65 cm high. It is decorated with a man standing under an arch with his hands held up. There are two crosses on either side under three stilted arches. The base is 20 cm high and decorated with roll moulding. The font rests on a large stone disc which forms part of the floor. 4. The font (original photo courtesy of Fernando Garcia Gil).